So, you want to become your own boss and be a big-time blogger? Starting a blog is an exciting time! The possibilities are endless and you don’t really know what your blog or following will look like in a year, two or three. If you play your cards right, you could be on an all expenses paid press trip to the Maldives or you could be featured in a six-figure L’oreal campaign. It really is down to you and what you make of it. Never one to sell dreams, I’m here to equip you with 10 things you should know even before you embark on this journey. 1. Blogging takes dedication, time and effort: Blogging will not make you an overnight success. Is there any job that will? If there is, please sign me up for it. It takes dedication, time and effort to produce the level of content that you need to catapult your blog into A-list status. Be ready to put in the hours. I’ve had some of my best life opportunities come about as a result of my blog and have also met people who have changed my life- it is a lot of fun. But, there’s also real work involved- the type that never makes it to instagram because it’s just you sitting infront of your laptop editing photos and writing for four hours straight. 2. Your blog name matters, and you should buy your domain name: You need to choose a blog name that’s unique but memorable. You don’t want to compete for placement within search engines with websites that are bigger than yours. You also don’t want people to search for your blog and land on another website- this will affect your traffic. These days, ‘blog’ is a dirty word. You want a website, rather than a blog and some bloggers even call themselves writers, or editors. The great thing about blogging is that you can call it whatever you want. But you want to buy your domain name and have a ‘.com’, or ‘.me’ etc. 3. Know the best platform for your blog: There are many different platforms that you can build your blog on such as Squarespace, Blogger, WordPress etc. When I first started, I built my blog on wordpress.com. When I started working with an affiliate company (a method of making money via commission from purchases through your blog links), I had to switch platforms to wordpress.org. It’s a lot of hassle to move your blog platforms so it’s best to start with the best platform for your blog. 4. You need to consistently stay informed and ahead of the game: We are in the digital age and things are constantly changing all the time. Instagram changes algorithms, copies snapchat and implements a slideshow all in the space of a few months. Being a blogger is also about being a trend-setter. You’re influencing the general public with your aspirational lifestyle, so you always need to stay ahead of the game. 5. You can’t compromise on content. It’s Quality over Quantity: Gone are the days when your followers were so desperate for your content that you could post anything just to keep them happy. There’s content everywhere- yours needs to stand out. You need to be consistent but you’re better off putting hours into a solid blog post than a few average ones. Don’t take your followers for granted- they can tell when you upload a lazy post. 6. You don’t have to do the cliché thing such as attend fashion week! : You don’t have to be cliché. If you’re a fashion blogger, you don’t have to spend years agonizing about how you can’t get fashion week tickets, and if you’re a travel blogger, you don’t have to travel to Tulum just because everyone else is. 7. A blogger friend will drastically improve your blogging quality of life: Find you a blogger friend and flourish. It is possible to blog without a blogger friend. But, it’s great to have a wingman to attend events with and someone to take photos with free of charge. You can both shoot each other and also promote each other to your audiences- a wider reach is never a bad idea! 8. Use Google Analytics: Check your statistics and analyse them. Know your audience- their gender, where they are from, what their online habits are. Make sure that your content is reaching the people you have intended for it to reach and capitalize on what works for your audience. You have to stay informed to plan your next move! 9. Social Media is Non-Negotiable: You have to have a good social media presence. Put an effort into curating your social media channels so that they appeal to your intended consumers. Twitter is really good for building a loyal community- my twitter feels like a little family and I love it! 10. It takes time to earn a full-time living: You want to build a career that stands the test of time- longevity is key. It takes time to build a great brand and earn a full-time income, but with the right training, it’s very possible! Hence, why I launched The Full-Time Blogger. 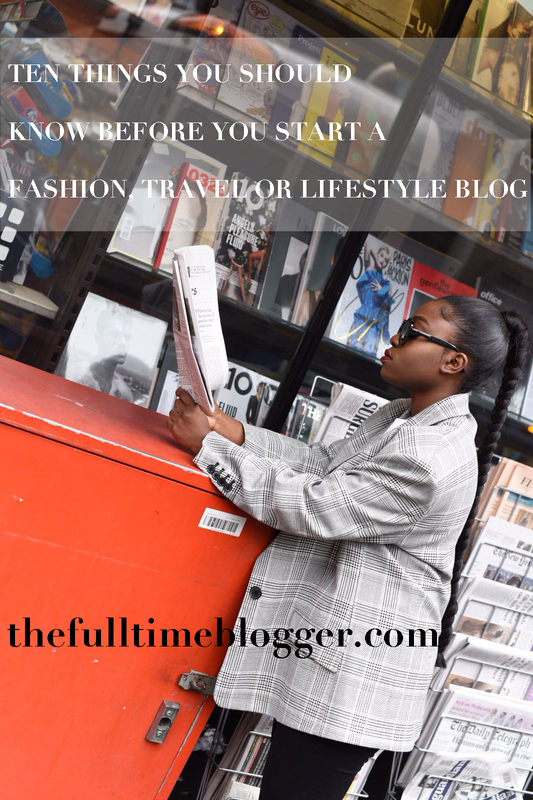 On March 16th 2017 (Thursday), at 7.30pm (London time), I will be hosting a webinar masterclass along with my website designer to teach you everything you need to know about becoming a Successful Full-Time Fashion, Travel or Lifestyle Blogger. Sign up here, where you can also see all the modules that we will be covering. I can’t wait to see you on Thursday! Fashion Blog • Personal Development • The Full-Time Blogger | Tagged: | 9 responses. I wanna be a fashion and travel blogger. This has always been my dreams but looks like I know nothing about it, even after reading all of these I still feel the message I need hasn’t been passed. Although, I learned from the post, I just still feel the message for me hasn’t been passed! Reach back please! What’s the best way to make blogger friends? I registered!! I had 3 blogs so far and never knew the right strategies to monitized from it. I watched the video and read the tips above. I wanted to use Wix to create my blog, are you familiar with them? Thank you for sharing. I use wix. I think it’s amazing. Thank you for this dear Fisayo, I wish you could be my mentor because you really inspire me. I have a blog but i’m working on growing it better and you are my super role model. PLEASE DOES ANYBODY KNOWS IF SQUARESPACE GIVE .COM DOMAIN? IS IT A GOOD PLATFORM TO HIT OFF CAREER IN BLOGGING? PLEASE HELP A FRIEND.